"Damn, it's freezing. I know I said I'd go for a run, but in this cold it's probably unhealthy, right?" Sound familiar? It's this line of reasoning that keeps me on the couch, watching Downton Abbey, crying into my nachos. But is running in cold weather actually unhealthy, or is it just a flimsy excuse? To find out, we talked to the legendary Dr. Jack Daniels, one of the world's best running coaches, and got the skinny on cold. You've already heard of Dr. Daniels if you are one of the gazillion people that read Christopher MacDougal's Born to Run, where he's prominently featured. He's the guy that analyzed the gait of elite runners and came back with the 180 strides per minute figure that you hear so often today. He wrote Daniels' Running Formula, he is widely regarded as one of the best coaches in the world, and he lives in a place with cold winters. The man knows what he's talking about. A lot of people think that at a certain temperature your lungs will freeze and you'll die. Except in very extreme conditions (a cold day for the Yukon) that's not something you need to worry about. "The pulmonary system is very very good at warming air," said Daniels. "That doesn't mean it's going feel good to go running at 40 below, but it probably won't freeze your lungs." He cited a study, done many years ago, in which doctors measured the temperature in dogs' lungs while they were inhaling air that was negative 40 degrees F. The air they exhaled matched the dogs' body temperatures. At the same time, Daniels points out that when it's really cold there is virtually no moisture in the air. So even though you're not freezing your lungs, you can certainly dry them out. Your throat and lungs can even crack and bleed if you dry them out enough. Aside from that, generally the greatest physical danger you face when it's freezing out is slipping and falling in some ice. We previously gave you some tips to avoid slipping while running, and Jack agreed with those. He added that you'll want to adapt more of a "shuffling" gait to maximize the surface area of your foot that comes into contact with the ground, giving you more traction, and he notes that you should be especially careful going downhill. I've definitely used the "getting over being sick" excuse more than a few times, but was I right to? While Daniels notes that he isn't an MD, he says most doctors usually advise, "If the cold is below your neck then don't run. If it's just in your nose, it's probably okay." That true for running period, but it goes double when it's cold out. When you have a cough, the tissues in your lungs and throat are likely to be weak and inflamed already. You don't want to compound those problems by pummeling them with cold, dry air. A lot of people say that when you run in the cold you should breathe in through your nose and out through your mouth. The theory is that taking air in through your nose warms it better than when it comes in through your gaping mouth hole. Daniels points out, though, that the majority of people simply cannot get enough air to run when breathing in through their nostrils. And that's a healthy person on a nice day; someone with a stuffy nose in freezing weather? Forget it. A big mistake a lot of people make when it's cold is that they decide to do their warmup inside, where it's toasty and warm, and then head outside for their run. Sounds like a good plan, except for one little thing which makes it a terrible idea: sweat. "You're going to build up sweat, and then it will freeze when you go outside," says Daniels. "You really want to stay dry." Like many other coaches, he isn't a proponent of stretching before a run, either (it's thought to cause more injuries than it prevents). His advice: take it outside and start running, just go very slow and easy until your muscles warm up on their own, then you can speed up to your normal pace. Just don't rush getting there. It's a lot easier to tear a muscle, tendon, or ligament when it's cold and tight. 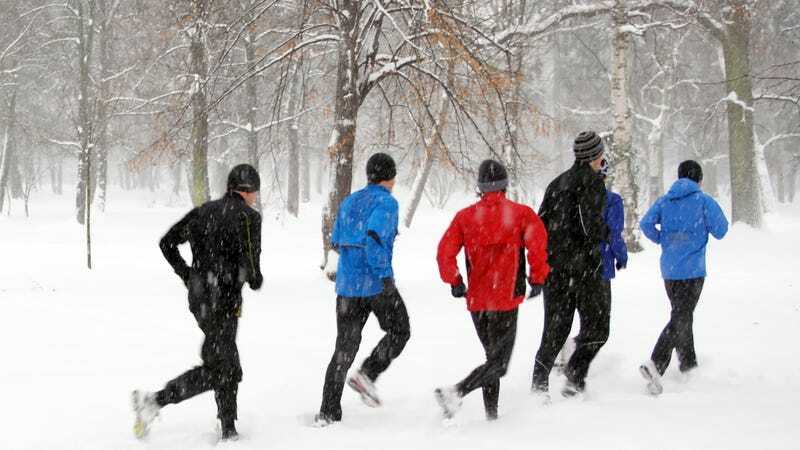 "I would say that the most important thing for running in the cold is to determine in which direction you're running," says Dr. Daniels. He doesn't mean north/south/east/west, he means in relation to the wind. Not only is running into the wind a lot harder, but it can freeze you. Jack tells a story of a run he went on when it was 14 degrees F and there was a five or six MPH wind, which isn't much. Not thinking, he set out running with the wind at his back, and he didn't even feel all that cold because his speed essentially neutralized it... until he turned around to come back. He'd gotten warm when running with the wind and worked up a sweat, when he turned into the wind, the sweat froze. By the time he got home, his hat had formed a solid ring of ice around his head. Not fun. When he was coaching in Oklahoma City (which gets rather cold and windy), he would use a van to drive his athletes out into the wind, then have them run back with the wind at their tails. Or he'd have them run out with it at their backs then pick them up. Sounds dreamy, but most of us don't have personal coaches willing to do that, so Jack recommends first running into the wind, and then turning around to have it at your back on your way home. There's always a lot of debate about the best clothes for anything, but there is general agreement that you want to wear a fabric which doesn't absorb water (e.g. not cotton). Synthetic threads are generally very good about this, but Jack's pick (and mine) is wool. "Wool is great when it's cold because it will keep you warm even when it's wet," says Jack. That said, preventing perspiration should still be a high priority. Layers are the best way to go, because as you heat up you can unzip or remove items to keep you right in your perfect temperature range. Jack suggests relatively tight, long-legged/sleeved undergarments. If you can afford it, go wool, and consider doing the same for your socks and a wool hat. On top of that, you want a layer than cuts through the wind better and can be vented in various ways. Gloves, too, should be wind-proof (or wind-resistant, at least). Remember to continually adjust things to keep from getting too hot. I had a guy that was a 2:12 marathoner who moved somewhere where it was cold. He didn't like running in the cold, so he did two 20-mile plus runs a week on a treadmill, then came to New York and and ran the NYC Marathon in 2:09! You just have to find a way to combat the boredom. Indeed, if you're going to be running on a treadmill all winter, you may want to invest in a tablet so you can catch up on movies as you pound out the miles. Also, because a treadmill does some of the work for you, you want to turn the incline to at least 1-percent which more closely mimics running outdoors. There are worse things than freezing cold weather. Jack's least favorite conditions are when it's 34 degrees, the wind is blowing, and it's raining. There is nothing worst than being wet when it's cold out. To that end, he recommends avoiding puddles like the plague. Get your feet wet on a really cold day, and your misery is more or less guaranteed. He also recommends carrying a cell phone with you just in case you should hurt yourself or need help. You do not want to be crawling along the ground when it's frozen. Above all, know your limits and pay attention to your body. Listen to your instincts and play it conservatively. Make sure you've eaten enough before your run, as you need calories to generate body heat. If you come home freezing cold, slurp down some hot soup and take a steamy shower. Not only will that help get your core body temperature back up to normal, but the shower will help moisten your dried-out mucous membranes. Above all, be safe, and check back next week for another Fitmodo. Huge thanks to Dr. Jack Daniels and Brian Rosetti of the Run S.M.A.R.T. Project. If you want personalized training plans, coaching, nutrition information, and other advice, you definitely want to check them out.